I know I've been away for a while but this past month has been a roller-coaster. Each joy has been followed by a subsequent loss and each sadness has been followed by a sudden boon. It's hard to say that I know where I'm going because I feel like I have yet to get the ground under my feet. I've had my computer breakdown and cost hundreds to fix, I've had a (slight) promotion at work. I've had my close friends move to California, and realized that I'm drifting from others. We as a nation stood for change (Yes we DID!) but the citizens of California decided to take away the rights of others. It's been ridiculous. I've gone from dancing in the streets to feeling like I don't know which way to turn next. And feeling completely helpless to having hope. 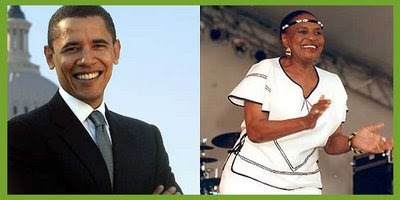 Today, I found out that Miriam Makeba, the wonderful South African songstress, has passed. I'm bolstered by the thought that she died while doing what she loved most and that she like all the others around the globe got to witness a major turning point in not only American but global history with the election of the first Black president of the United States. I'd like to think that when one door closes, it's only brief. It's only a sign that more is to come. There's no death, without rebirth. And I'm just experiencing growing pains.